On the auspicious occasion of Maha Sivaratri, here is a wonderful story of Bhakta Markandeya who could conquer death with his tremendous and unaltered faith in Lord Siva. Later he grew up into Markandeya Mahamuni (sage) and wrote 'Nadi Grandham' on palm leaves which are believed to be still preserved in the Markandeya Math in Puri, Odisha. He also authored Markandeya Purana. Long ago, there lived a sage named Mrikandu and his wife Marudvati who were staunch devotees of Lord Siva. Even after long years of wait, the sage couple could not beget a child. "Hey! Natha, there is no meaning for our life without children", said Marudvati to her husband in a disappointed voice. "Dear, I think Lord Siva is not yet pleased with our prayers", replied sage Mrikandu. The disappointed sage couple decided to perform hard penance to seek the blessings of Lord Shiva for having children. After several years of penance in the deep forests, finally one fine day Lord Siva was pleased with their determination, descended on to Earth and appeared in front of the sage couple. "Bhakta! I'm pleased with you both", the sage couple who were in deep penance heard these words. They slowly opened their eyes and shouted with joy, "Hara Hara Mahadeva! Sambho Shankara!". The sage couple were much rejoiced to see Lord Siva in front of them and prostrated before Him. Lord Shiva was much pleased with their devotion. "My dear child! tell me your wish", said Lord Siva in a hollow voice. "Shankara! you are omniscient. You know what we are longing for", replied sage Mrikandu. "Well! you are longing for a child. But tell me what type of a child you want?" questioned Shankara. The sage couple were puzzled with such a strange question and asked, "What do you mean Mahadev?" "Do you want a gifted child who will live only for 16 years or a dullard who will have a long life? ", asked Lord Siva. On hearing these words of Shankara, the sage couple were in confusion. For a while they thought this could be yet another test for their patience. After a while Marudvati spoke to Lord Siva, "Eeswara, we wish to have a gifted child, be it short-lived. A gifted child forever will live in our hearts". The sage couple once again prostrated before Lord Shiva who was pleased with their wise decision. He blessed the couple and disappeared. After an year Marudvati gave birth to a boy and the couple named him Markandeya. As the child grew up, he was initiated to learn Vedas. As he was a gifted child, he could easily master Vedas and Upanishads. He was an obedient child with great respect for his parents. From his childhood, Markandeya too became a great devotee of Lord Shiva. As the years were rolling on and the time was passing out, the sage couple started becoming gloomy and sad. Seeing the gloomy look on his parent's face, Markandeya questioned, "Mata, Pitah. Why are you looking so sad ? Have I done anything wrong or did I disobey your words at any time?" Hearing such sweet words of their son, the couple broke down into tears. "Oh no! dear child. In fact, we are proud to have a son like you but......", said Mrikandu with a sad voice. "But... what? Pitah. Please let me know the reason for your sadness. I'll try my best to get back your happiness", spoke Markandeya to his parents. The couple looked at each and made their hearts strong to speak out the truth to their child. Marudvati narrated the entire situation to her son who listened patiently. On listening to the narration, Markandeya neither get panicky nor got depressed for his short life. On the contrary he felt proud and blessed to have such strong-minded parents. At the same time he felt sorry for them as soon they will losing their dear son (i.e himself). Markandeya was determined to worship Lord Shiva for the rest of his life and get blessings from Him for a longer life. He thus spoke to his parents, "Mata, Pitah, don't worry for my life. I'll pray Shankara for a longer life. He who gave me this life, won't He bless me with a longer life?" His parents hugged him on hearing such determined / positive words. "Oh! son, we feel greatly relieved to hear your words. I'm sure Shankara who gave you this life, will sure to bless you with a longer life", said Mrikandu. Thus, Markandeya started worshiping Lord Shiva daily in His Lingam form. He spent day and night chanting Siva Panchaakshari Mantra (Om Namah Sivaya), Maha Mrutyunjaya Mantram and many more. Finally on his death day, suddenly the sky turned black and cloudy. There were lightnings and thunderstorm. Suddenly Yamadootas i.e the messengers of Lord Yama (the Hindu god of death) descended on Earth and appeared in front of Markandeya. They came to take away the life of Markandeya who was seated still with closed eyes worshiping Lord Shiva. As they approached him, they were obstructed by the radiance emitted from Markandeya. Each time they tried to go near him, they failed to do so. They returned to Yamaloka and told Yama that they couldn't approach / go near Markandeya as a strange radiance from him is blocking us. The enraged Yama decided to go himself to take away the life of Markandeya. Yama descended on to Earth and tried to approach Markandeya. Yama was shocked as He too could not. Markandeya became power-packed by worshiping Shiva. Yama spoke to him in a soft voice, "Child, your time on this Earth is up. Markandeya who was in deep meditation, opened his eyes and saw Yama. He did not get panicky / scared on seeing Yama but replied in a strong voice, "No, Yama Dharmaraja. You cannot take me. Shankara is my Savior and He will protect me". Yama repeated asked Markandeya to leave the Shiva Linga and come up with and each time there was a big 'NO' from Markandeya. The infuriated Yama finally threw his noose to trap Markandeya. By the time it reached Markandeya, he tightly hugged Shiva Linga with closed eyes and chanted loudly "Om Namah Sivaya, Om Namah Sivaya, Om Namah Sivaya". The noose tangled around Markandeya's neck along with Siva Lingam. Yama tried to pull the noose but failed to do so. Suddenly, there was a flash of light. The Shiva Lingam trembled and split into two halves and Lo! there emerged Mahadeva from the Lingam with his Trishul (trident). Lord Shiva was infuriated and raised his Trishul saying, "How dare you come to take away my bhakta (devotee)?" 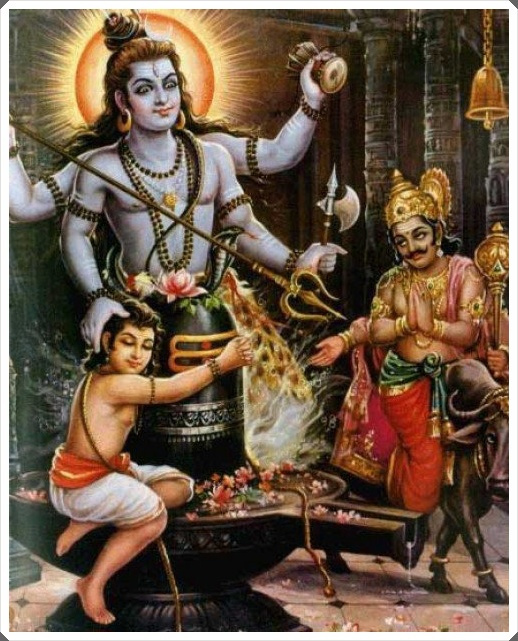 Yama got sacred on seeing the anger of Rudra (one of the names of Lord Shiva). He left his noose, humbled down and spoke in a pleading voice, "Mahadeva! I'm extremely sorry for the act. But would like to remind you that Markandeya's time on this Earth is up, so I have come to take him away with me." As Yama humbled down, Lord Shiva calmed down and spoke out, "Yama Dharmaraja, you cannot take away my devotee Markandeya. Now he has extra-ordinary powers and he conquered death." Yama bowed down before Lord Shiva while all the heavenly gods showered flowers on Bhakta Markandeya and blessed him. Bhakta Markandeya, who was a silent spectator, became dumbstruck. After a while he realized what had happened and prostrated before Shankara who blessed him with a long life. Thus, Markandeya could conquer death with his determined devotion and unaltered faith on Lord Shiva. From thence Lord Shive got the name 'KALANTAKA' as He could stop the time out / bring an end to the time out of Markandeya on this Earth. The blessed Markandeya happily returned to his parents and lived a long life.